Manpower: Peace International Pvt. Ltd.
Job Categories: Gulf Jobs Demand. Job Types: Contract. 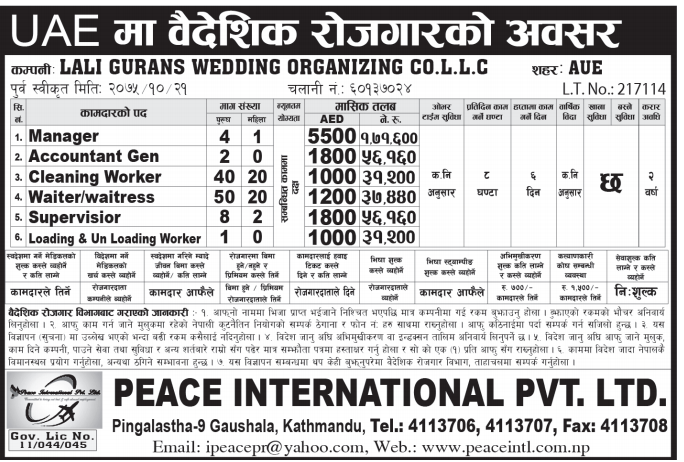 Job Tags: EJOBS, Ejobs Nepal, ejobsnepal, HAMRO JOB, jagire, job demand from UAE, job vacancy, Job Vacancy For Manager, JOB VACANCY FOR VARIOUS POSITION, Job Vacancy In LALI GURANS WEDDING ORGANIZING CO.L.L.C Position: Manager, Jobs in Kathmandu, jobs in nepal, mero job, mero rojgari, Merorojgari, Nepal, Nepali Jobs, nepalijobs, timro job, and wanted. Salaries: 100,000 and above.